Leaders Who Helped Bring Labor Organization to Support of the Muhlenberg Hospital. 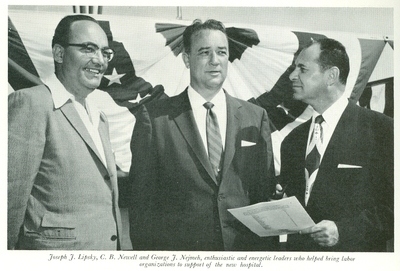 At Groundbreaking Ceremonies, Joseph J. Lipsky, C. B. Mewell and George J. Nejmeh. Enthusiastic and Energetic Leaders who helped bring labor organization to support of the Muhlenberg Hospital.